Kevin Harris, Associated Student Government community relations vice president, listens on Thursday during a meeting of the city’s Planning and Development Committee. 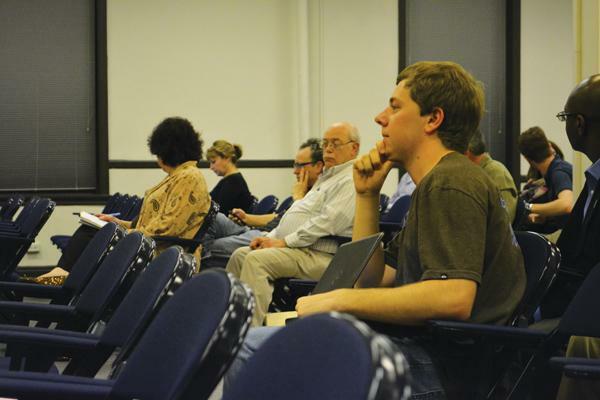 Committee members discussed changes to the city’s occupancy laws. Although no one has ever been evicted for violating the “brothel law,” the city plans to enforce a watered down version of the occupancy ordinance should City Council pass it, Mayor Elizabeth Tisdahl said Tuesday night. At a Planning and Development Committee meeting, aldermen discussed potential changes to the over-occupancy rule, which prohibits more than three unrelated people from living together in a residential unit. Associated Student Government members attended the meeting to represent off-campus Northwestern students. The amendment would increase the number of unrelated people allowed to live in a single unit from three to four. Apartments could house up to six unrelated people as long as there are an equal number of bedrooms as tenants and the landlord applies for a safety permit. The commission referred the bill to the city’s Plan Commission, which will meet July 10 to review the ordinance. Ald. Don Wilson (4th), who wrote the proposal, said the ordinance would likely undergo further revision at the meeting. Steven Monacelli, former ASG community relations vice president, also attended the Tuesday night committee meeting. He said the amendment has gained support beyond Ald. Jane Grover (7th) and Wilson, the amendment’s two most vocal proponents. Under the proposed amendment, people with blood relations would continue to enjoy less-stringent standards than unrelated people living in a unit, said Howard Handler, local government affairs director for North Shore-Barrington Association of Realtors. Handler proposed that the number of bedrooms in a unit be at least two-thirds of the number of unrelated people living in a unit instead of the equal number in the current proposal. Monacelli called the proposed changes the most “fleshed out version” of much-discussed reforms that he has seen thus far. “Everyone was on board with some sort of change … with the basic idea that safety comes first,” said Kevin Harris, ASG’s new community relations vice president.